With all the recent storms Southeastern Idaho has been having, it is a good idea to know how to prepare your house for these Spring showers. On www.hometips.com they offer these tricks and tips for a worry free spring. Inspect the house siding. Check for damage, cracks, and holes. Seal up leaks with paintable or clear caulk. Make sure the paint is in good condition. If it isn’t, consider getting the house painted before winter really sets in. Weatherstrip windows and doors to seal out drafts and minimize heat loss. For more, see Weatherstripping Windows and/or Door Weatherstripping Options. Prepare or install storm doors and windows. If your home has a combination storm/screen door with interchangeable glass and screen panels, switch from screens to glass (see Screen & Storm Door Buying Guide). Spray a little WD-40 on the storm door’s hinges and latches. Be sure the door closer is adjusted and working smoothly. Clean your gutters and downspouts. When gutters and downspouts clog with leaves and debris, water overflows and spills down where it can damage walls and footings. Please see Rain Gutter Cleaning & Maintenance. If your house is beneath many trees, it’s smart to clear the gutters at the beginning of the season, and then clean them again after the first rain to remove leaves and debris that wash down from the roof. Check your roof, skylights, and flashing. The roof is the most obvious point of entry for rain. Please see How to Find & Fix a Roof Leak. If checking your roof is more than you want to handle yourself, please see our affiliate partner, HomeAdvisor, to receive free bids from local asphalt shingle roof repair pros. Repair gutters and downspouts. Fix loose, sagging, or leaking gutters and make sure downspouts carry drainage well away from the house. For more, see How to Fix Rain Gutters & Downspouts. With the Spring months upon us most of the region will soon be, if not already, facing lots and lots od downpours. This is the time for you to start getting your house ready to transition from stormy skies to warm sunny weather. On www.thenest.com they suggest these tips and tricks to keep you ahead of the game. Repair the Walkways - Snow and cold can wreak havoc on your walkway. With warmer weather approaching, take this time to patch cracks and replace loose bricks and pavers. Rent a power washer or purchase a chemical treatment to clean up embedded stains in concrete, stone or asphalt. Prune and Mulch - Prune dead branches, trim back overgrown shrubbery and remove any obstructive plantings. Spread mulch or bark around trees, shrubs and flowers for a weed-free, well-kept look. Keep it clean - Sweep the sidewalk and stoop, clear away cobwebs, tighten wobbly railings, and repaint posts and supports. Clean Gutters - This can save you a lot of money on repair costs. Inspect your downspouts and gutters just before the spring rains start to be sure they’re clear of leaves, tree limbs and other debris that might cause problems later on. Clogging usually occurs at the elbow in a drainage system, where the downspout connects to the gutter. Since this elbow is relatively easy to remove, take it off and inspect for clogging. Here at SERVPRO we feel like we are only as good as the feedback we receive from our customers. We train our employees to always try and go above and beyond for our customers. Below is a real life review we received this week! Thank you both so very much for your careful and professional attention to the recent water loss at my home in Jackson, Wyoming. You and your team have done a very neat and thorough job of caring for the home as well as making me feel comfortable with the entire process. I very much appreciate the time you’ve spent reviewing the estimates so I know we’ve captured everything correctly. I look forward to receiving your final report – we’ll use that to get the remaining bids and info needed to complete this process. Please don’t hesitate to reach out to me if you need anything further from me at this time. 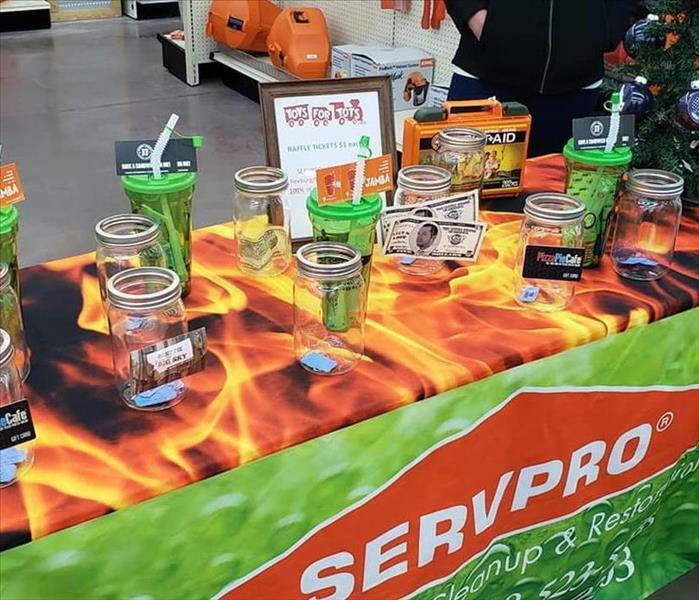 SERVPRO of Idaho Falls is huge in helping out our community! We love being involved in as many organization projects as possible. This last Christmas were lucky enough to be able to show our support and assist Toys for Tots in raising over $350 as well as two boxes of toy donations. Our Marketing/Sales Rep Corey was able to go around to over 10 businesses in town and get donated items such as gift cards and gift baskets. All proceeds from those raffles went straight to Toys for Tots. We went to Black Bear Diner as well as Cal Ranch to set up booths and inform people about this wonderful organization. People were wonderful and really helped out their community and all of the wonderful children in it. We cannot wait to be involved again Christmas 2019 and raise as much money and toys to help out our community as we can! SERVPRO of Idaho Falls is a veteran owned and operated business. Our owner Skylar price served in the Army for 9 years. This last year we were able to be a part of a Veteran motorcycle ride called Ride 22. On their website, this is how Ride 22 is described. Ride For 22® is a non-profit 501c3 organization who cares deeply and passionately about serving our nations’s military and their families. Our mission states we will do three things: spread awareness of PTS and educate the public, serve as a living memorial and provide support and comfort to the loved ones left behind. We hope to accomplish this mission in several ways; participating in ride events, recruiting other riders to join us in raising awareness, being visible at events such as ride’s and health expos, networking families to help each other through the grieving process, help with ride registration fees for veterans battling PTS or the families of those who have lost the battle, share helpful resources to help those suffering or dealing with loss, and much more. Our hope by raising awareness and educating the public is that we can help eliminate some of the stigma that surrounds military PTS and allow for veterans to seek and receive the help and social support they so desperately need and reduce the number 22 to 0. Here at SERVPRO we try and take the absolute best care of our customers. We make sure to implement proper training for all new hires that starts and ends with proper customer service. We believe that the customer should be more than happy with the job and job process so we make sure to check in with them throughout the job to make sure that they are satisfied with the work we are preforming. We believe that having excellent customer service is key. On www.myperfectresume.com they define what excellent customer service means. What does it mean to provide excellent customer service? Providing excellent customer service means going the extra mile in making sure a customer is happy and satisfied with a company’s products or services. It also involves providing service to a customer in a timely, pleasant manner. In order to provide excellent customer service, one needs superb communication and problem resolution skills. Why SERVPRO? Because SERVPRO prides themselves in being faster to any disaster. With over 1,500 franchises nationwide, we can be anywhere you are. We know that when disaster hits the last thing anyone wants is to have to wait for help. We are confident that we will be there for you in a timely manner and to be able to start helping right away. To make sure that we stand true to our promise, we are open twenty-four hours a day, seven days a week. We have on call managers and technicians to make sure we are able to help whenever disaster may hit. We know that disasters are not planned and we want our customers to feel secure and to know that we are available 100% of the time. 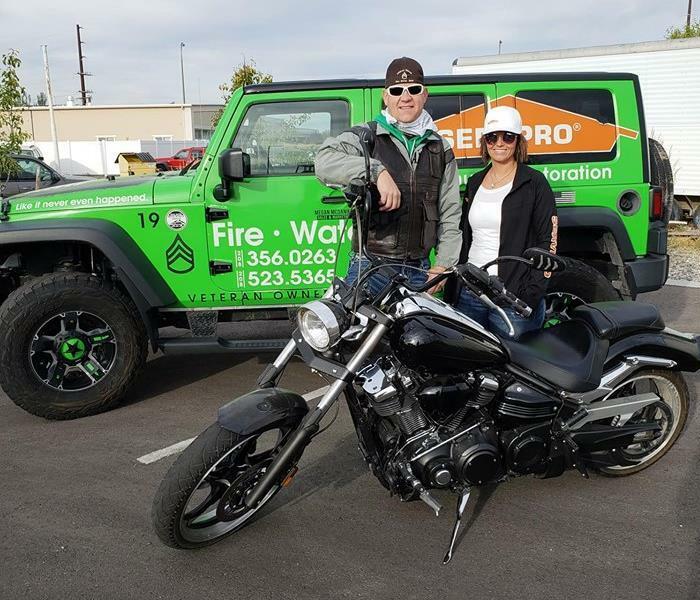 If you have a fire, water, mold, or asbestos disaster, give SERVPRO a call today at (208) 523-5365. We also offer duct cleaning! Why SERVPRO? When I began working for SERVPRO I knew close to nothing about the franchise that I got hired on to. I learned quickly that it wasn’t just another “restoration company franchise” but a family. This SERVPRO is independently owned by two of the nicest, hardest working, wonderful individuals I have ever met. They don’t just treat this like a business but like a family. They care about their employees and are there for them whenever we need them. We have monthly company meetings and the marketing department gets to spoil the other employees with a HUGE yummy breakfast as well as treats most months. Every employee is required to attend these meetings because at our franchise they want to hear everyone’s suggestions, opinions, questions, and concerns. I believe that a successful business treats their employees with respect and that is exactly what they do. I am extremely proud to be working for a company as amazing as this one. What's down in the basement? Our crew was at a new water loss in Mackay, ID. The owners were gone for two months. They came home to find their flooring was severely buckled and there was standing water in the basement. The loss was from a water line that was going to the kitchen sink that had frozen and then broke. Our crew had to pack out all of the contents before they were able to start the demolition process. According to www.consumerreports.com they have a few ideas to possibly help avoid a freezing pipe. Let the cold-water drip from a faucet served by exposed pipes. Running water through the pipe—even at a trickle—helps prevent pipes from freezing. For the long term, add insulation to attics, basements, and crawl spaces. Insulation will maintain higher temperatures in those areas and prevent drafts, seal cracks and openings around windows, doors, and at sill plates, where the house rests on its foundation. If you have a fire, water, mold, or asbestos disaster give us a call today at (208) 523-5365. Winter storms whether it be snow, hail or rain can cause substantial damage to your home. There are plenty of checklists online you can search for to make sure parts of your home weren’t damaged during a storm. On www.propertycasualty360.com they list seven different areas they feel are important to check over. 4/3/2019 - Flowers are starting to bloom! 3/26/2019 - Reviews help us grow! 3/6/2019 - Employees are everything! 2/14/2019 - What's down in the basement?